Book review: "A Thief of Time"
This review first appeared in Chula Vista Star-News in 1988. The problem with most mysteries is that the authors seem more concerned with concocting a believable sequence of criminal events than in creating flesh-and-blood characters. There is likewise a tendency to put more attention into the trail of evidence than into the description of the locale. The best authors overcome these temptations and create a complete novel. But there have been only a few who have managed to create a full story within the mystery framework  even Agatha Christie's works failed to generate any kind of living environment to surround the crime. Tony Hillerman, however, is of the first rank  joining the likes of Raymond Chandler and Dashiell Hammett. 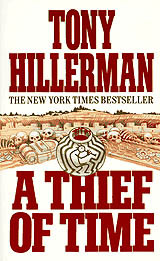 Hillerman's "A Thief of Time" seems based on the unstated premise that real crimes occur in real locations and happen to real people. Thus, the description of the area on the Navajo reservation in Four Corners country where a mysterious disappearance occurs is just as important as the clues. Hillerman's description of the cold autumn winds blowing through back country canyons is enough to make you pull a sweater on while reading. The characterizations are also of the highest order, with the major players being fleshed out, with all the faults and shortcomings inherent to real-life human beings. Hillerman's detailed descriptions of the Navajo characters, their confused feelings about their ethnic heritage and the conflict between it and modern society, breathe life into his story. The descriptions never become obtrusive, remaining as natural a part of the story as the events themselves. As to the events, things are never quite what they seem. An archaeologist disappears, and her friends suspect that she is attempting to make illegal digs. Two tribal police officers (the now-classic Joe Leaphorn and Jim Chee) are assigned to find her, going through the usual litany of dead ends and false starts before solving the case in timely fashion. Reading Hillerman is pleasure not only for the fine story he tells, but for the sheer joy of watching how he does it.